Supermoon-2017. An Article in Life Positive Magazine. 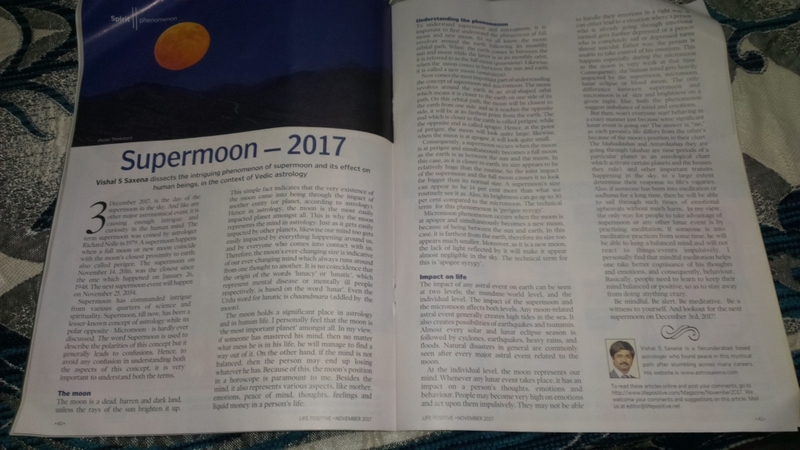 I am happy to share that one of my article on Supermoon-2017 is published in November-2017 issue of Life Positive Magazine. Life Positive is a positive thinking magazine from New Delhi and spreading optimism among people from past many years through its articles on various subjects. My experience of working with Life Positive is such great that I would wait for my next opportunity to write for them. In case, you want to buy November-2017 issue or more, please have a look at their site - https://www.lifepositive.com/. I am sure that site is going to open a new world of optimism for you. Thanks for all the help and support. Special thanks to Ruby S. for editing the article. FB live tomorrow, i.e. 3rd Nov. 2017 at 12 Noon IST on interpretation of Rahu/Ketu Transits.